Do you struggle with too much stuff? Are you overwhelmed by too many commitments? Do you feel like your mind is running away with itself? It’s really not difficult to simplify your life. 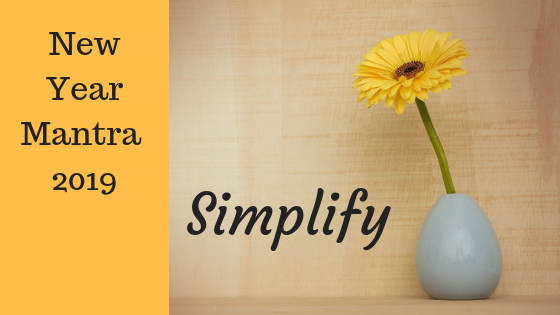 Focus on these seven areas for simplicity and enjoyment. 1. PAPERS Reduce snail mail that comes into the home. Declutter files and boxes of paper. Establish a filing system to eliminate unsightly paper piles. 2. CLOTHES Go through closets, drawers and storage bins. Cull the pieces that have not been worn or are no longer wanted. 3. SHOES Handle each pair of shoes and boots. Be realistic about what you wear or expect to wear some day. Get rid of the rest. 4. ACTIVITIES Re-evaluate why you are involved in each activity. Cut back on those that are no longer enjoyable or do not support personal goals. 5. PURCHASES Delay new purchases for a couple days. Be honest about whether the purchase is a need or a want. Remember, the less you have the less you have to maintain. 6. EMAILS Take time to go through the inbox. Delete unneeded emails. Unsubscribe from email lists. Set up rules that separate emails into folders automatically. 7. EXPECTATIONS Release ideas of perfectionism. Be grateful for what you have. According to nationaldaycalendar.com the home economists at Whirlpool Home Appliances established the Clean Out Your Refrigerator Day in 1999 to encourage families to prepare for the Thanksgiving holiday. Indeed, autumn is a good time to freshen up the fridge and make room for fresh seasonal foods. There are three parts to cleaning a refrigerator: decluttering the contents, washing the inside and cleaning the outside. If your time and energy are limited it might be more manageable to focus on just one aspect at a time by breaking the job down into three or more sessions. ​Want to learn more about Attention Deficit Hyperactivity Disorder? Most people with Attention Deficit Hyperactivity Disorder (ADHD) struggle with chronic disorganization in their day to day lives. Do these challenges sound familiar? Inability to: find things when they are needed, make decisions about what to throw/give away, start and/or finish a decluttering project, sort/organize belongings. Fear not – there is hope. Organizing solutions for people with ADHD must be simple, creative and deliberate. Try the tips below that speak to you – it’s worth taking the time now in order to save time later. Your future self (and your loved ones) will thank you. Is ADHD Causing Your Disorganization? We focus on the topic of ADHD this month since October is ADHD Awareness Month. Many of our clients have been diagnosed with ADHD, a frustrating brain disorder that impacts the ability to be organized. People with ADHD experience significant problems getting started on organizing tasks, following through on these tasks, and maintaining organizational systems. They struggle with organizing things or with managing time. In many cases they struggle with both. What exactly is ADHD and how does it affect organization? Does Self-Improvement Lead to Better Organization? Embarking on self-improvement? Organization will follow! In this month of Self-Improvement, we encourage you to think about self-improvement as the foundation for getting organized. Work on these common self-improvement goals: exercise, eat better, change habits, set goals, be mindful, be thankful, learn new skill, stop wasting time, and accept change. Then you will find that organization naturally follows. That’s because disorganization is often rooted in poor time management, lack of goals, living mindlessly and, yes, lack of exercise and poor eating habits. Once the mind is trained and properly nourished then it can function effortlessly to clear the environment. Why not work on self-improvement this month and reap the added benefit of organization? See the previous post for self-improvement ideas. ​September is Self-Improvement Month! What a great time of year to re-focus on ourselves. As the days cool and shorten, it’s the perfect time for looking inward. Now is a natural point to assess our goals, make adjustments and create plans to carry us through the year end. We may want to declutter a personal space, set up a workable filing system, or finally organize a photo collection. Of course, self-improvement can encompass any area of our lives such as health, relationships, career, volunteering or education. How do we get started and make progress and maintain momentum? The best way I know is to choose a small improvement and go for it! Don’t be tempted with grandiose ideas that could lead to frustration but be realistic, honest, and practical. The purpose is to make changes that will improve the way we feel about yourselves. The changes can make us stronger, wiser, or more capable of dealing with everyday struggles. Thus, time spent on self-improvement is never wasted. What small self improvement would make a big impact on your life? Are you ready to make it happen?